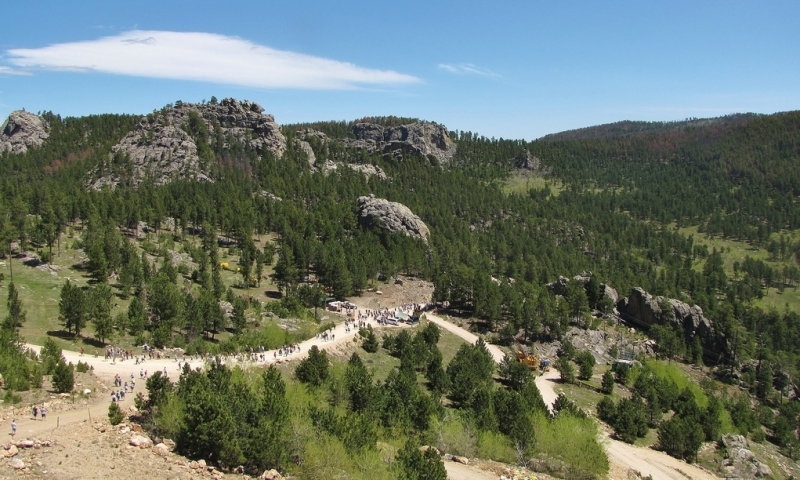 The Crazy Horse Volksmarch is a one of a kind organized hike. It is a unique hike as it is the only time each year that the public has the opportunity to see up close the mountain carving of Crazy Horse while in progress. This is the only time that the public can witness in such close proximity the nine story tall face of the Native American Chief. Overview: This is the only time that the public can witness in such close proximity to the nine-story tall face of the Native American Chief. The hike is 6.2 miles in total length – that's the round trip. It generally draws up to 15,000 participants. Details: The sculpture of Crazy Horse began in 1948 when the first blast took place on the mountain. The event has taken place on a Saturday and Sunday in June for the past 20 years. There is no advance registration, but all hikers must check in at the starting point. The Memorial gates open at 6 a.m., and starting times for the hike are 8 a.m. to 1 p.m. each day. Hikers must register by 1 p.m. and be off the trail by 4 p.m. No pets of any kind are allowed on the trail.